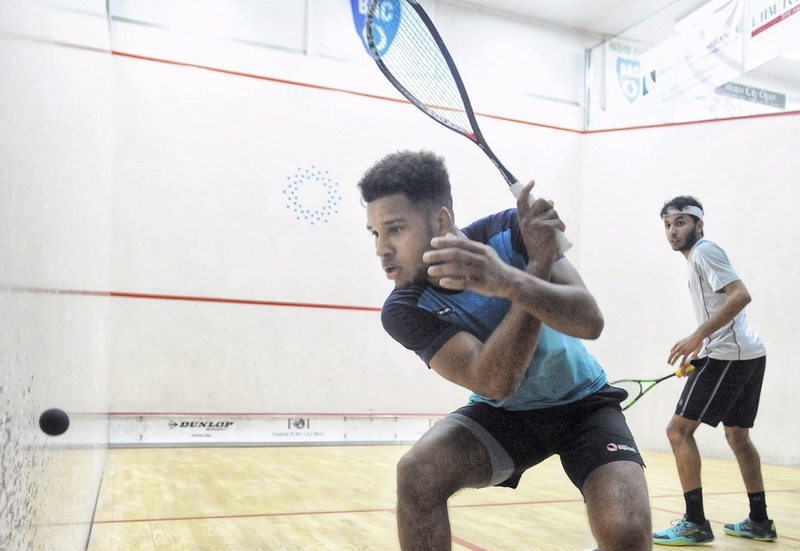 Richie Fallows edged past young English rival George Parker to book a place in the qualifying finals of the Squash Squared Wimbledon Club Open, which has this year raised its status to a $35,000 event on the PSA World Tour. Fallows led by two games before Parker hit back to pull the match level. In a close fifth game, Fallows squeezed home 11-9 to clinch a place in tonight’s qualifying finals against the experienced Finn Olli Tuominen, who beat rising England star Tom Walsh 11-7 in the fifth. Top qualifying seed Chris Simpson was forced to work hard, pulling back from 2-1 down before beating India’s Mahesh Mangaongar 11-4 in the fifth. Simpson faces another tough task tonight against Josh Masters, who overcame Robbie Downer in four games. Nathan Lake was pretty ruthless against Hasnat Farooqi, dropping a handful of points, on his way to a qualifying final match-up against US number one Todd Harrity, who overcame Belgium’s Jan van den Herrewegen in four. World No.50 Lake, who impressed against Ali Farag on the glass court as wild card at the Canary Wharf Classic, will be keen to advance against an opponent ranked two places below him. Spain’s Iker Pajares Bernabeu beat Jaymie Haycocks in straight games, but there will be no all-Spanish clash as Edmon Lopez fell in straight games to Egypt’s Youssef Soliman. The third Squash Squared Open kicked off on Sunday at the Wimbledon Club with eight matches in the first round of the qualifiers. This year the prize purse has grown to $35,000 from last year’s $25,000 and the entry list has fourteen players in the world’s top 50 and five are within the world’s top 30. Some are fist timers and others are returning popular faces such as the tournament’s inaugural winner and former world number 1, James Wilstrop. At a local level, four players who represent The Wimbledon Club in the Surrey Cup squash league are in the draw, namely Rob Downer, Jamie Haycocks, Hasnat Farooqi and Tom Walsh. Funds from the tournament and auction again go to help grow the club’s charity for deserving children, Squash Squared, with 80 pupils from local primary schools attending weekly coaching sessions enusuring our squash reaches the masses at grass roots level. The tightest matches in today’s eight qualifiers were between Chris Simpson and Mahesh Mangoanar (3-2), and Ritchie Fallows and George Parker (3-2). The referee had a challenge keeping two tall men, Fallows and Parker, apart and giving fair rulings “as he saw it”. It was a fiery affair with honours equal on lets and points with Fallows running out 11-9 in the final game. This confrontation was awarded our “TWC Match of the Day”. Earlier in the afternoon, Chris Simpson kept his head and came through from 1-2 down against talented Mahesh Mangaonkar from India. The club shared in the festival tournament atmosphere as 145 people enjoyed lunch in the restaurant on a sunny day overlooking a snow-covered cricket pitch. PSA M35 Squash Squared Wimbledon Club Open 2018, The Wimbledon Club, London, England.